It doesn't matter how large your business is, it should be present on the internet, otherwise you'll miss lots of clients. We offer you a simple solution able to free you from all the troubles connected with website design. 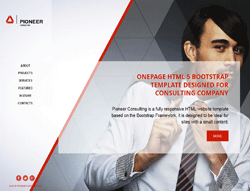 Pioneer Consulting is a clean and fully responsive one page HTML Bootstrap template, it is best suited for business websites, however with some quick adjustments it can also work for media, creative agencies, artists, models, etc. Reliable is a 100 responsive and cross-browser compatible template built with valid HTML5 and CSS3 standards. It based on solid code and the brand new Bootstrap v3.3. It makes use of modern jQuery and CSS3 techniques to create superb eye-catching animations and make your visitors love you and your website. The template is best suited for websites with minimal content, but allows for more content to be displayed in elegant popups.